Mike, please tell us about yourself—where you’re from, what you’ve done besides writing, yours favorite colors, movies, authors—all those things that make you interesting. I was born on exotic island of Oahu, Hawaii as an Air Force brat. I spent the next first 14 years of my life exploring half the globe with my family. I have seen the Orient, half the States, and most of Europe. It was from these amazing worldly experiences that my love for learning grew. That translated into writing for me. I like to take what’s right around me and channel that into a piece of work. It makes my writing authentic, relatable, and honest. Lots of great choices there as far as I’m concerned. When and why did you begin writing? I began writing as a way to document my travels around the globe. It gave me a focus. I listed the people, places, buildings, cultures, and animals. From there, I started making cartoons. In high school, I started experimenting with poetry and writing short shorts. But it was in college, that the real seed was planted. During a children’s literature class (in the late 80s), a two-day assignment stuck with me and prompted me to write. On the first day, the teacher asked for male heroes from bonafide books/series, i.e. no Disney-made books, comic books, or the like. We filled up the chalkboard. Day two arrived, and we were to list the female heroes from books/series. After an hour, we only came up with four, (my contribution was Nancy Drew). What a shock. Then, to drive the point home, we had to visit a bookstore and try and find any more female heroes. It was sad. Sure, there were books with girls and ponies, a babysitting club, cookbooks or craft books, and teen Harlequin. I left the bookstore dejected and shelved that data for a later date. The idea of me actually writing germinated after several of my female students from the 00s asked me, “Where are the (smart, strong) girl heroes? Where are the girls of color?” That literature class flashed in my mind. I told them I’d go look, and later that day, I set out for the bookstore again. I was shocked again. Not much has changed. That’s when I started to write about strong smart girls of color as forefront heroes. Several years later, Zoey Le Mar and the Veil of Fear was born. For the moment, I’m writing for Children’s/Young Adult. I may dabble in Murder/Mystery later. I am proudly a by-the-seat-of-my-pants writer. Nothing’s planned. Once inspiration comes, I start recording, reciting, or taking notes. I have tried that other method, but it’s not for me. I like the surprise/charge of getting inspired and going with the flow. I would say that Terry Brooks has been the most influential writer that has inspired me. I read “The Sword of Shannara” (all daunting 732 pages) as an impressionable teenager. It struck a chord in me. I felt like his main character, sheltered in his own little world. He was forced to flee from everything he has known, fight for his life, and discover who he was. I try to emulate those raw conflicting emotions his characters face, the fight or flight situations, and his wonderful setting descriptions. Zoey Le Mar and the Veil of Fear is my favorite book so far. It starts the series about smart, strong, sassy, multicultural girls as forefront heroes. Girls are just like boys. Girls have value. Girls matter. Zoey Le Mar is an amalgam of three girls I used to teach in third grade. I like to pick and chose the strengths, weaknesses, and quirks of my characters from former students. The best experience I received as a writer was when I was getting praise from fellow writers that I understood how to show, and not tell. Another high point was when I was getting good comments and reviews about my writing. That’s such a boost to the ego. It’s what keeps us going, isn’t it? Share the best/worst writing advice you ever got. The best advice I received as a writer was: “It’s not personal. It’s business.” It took me a long while to truly understand what that meant. I was not being attacked, my work was. The other part of that advice was: “Grow a thick skin.” The writing/publishing world is not for the faint of heart. It’s brutal, bloody, and unforgiving. Ain’t it the truth! (Laughing here) What is your latest published work? The latest published work is Zoey Le Mar and the Veil of Fear. 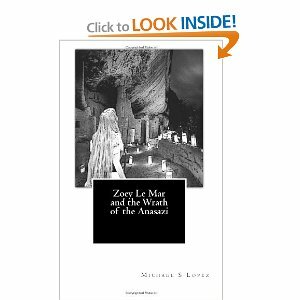 Book two, Zoey Le Mar and the Wrath of the Anasazi, just released summer of 2013 and is available on Amazon. The idea of the series will draw upon the ancestry and history of the characters. So in book two, Danielle Hernandez’s Native American heritage is explored. The teacher in me likes to tell a good story and educate the audience all at the same time with a big pretty bow. LOL! Feisty, eleven-year-old Zoey Le Mar finds out that she’s inherited her father’s curse. She scoffs then rejects her familial responsibility and endangers everyone around her, even knowing of the bizarre bedtime fairy tale, experiencing the recurring dreams, and receiving staggering premonitions. Now, the monsters from her dreams return for real, and her younger brother pays for her defiance. To make matters worse, she accidentally involves her best friends and two fellow classmates, and one by one, they get abducted into a pocket realm ridden with hidden traps and horrors beyond imagination. Luckily, old forgotten magic aids Zoey as each experience inches her closer to saving her brother and her friends, all in the hope of ending her responsibility and finding a way home alive. In this full-fledged fantasy infused with preteen drama, Zoey drifts aimlessly on a self-made river of denial until she clashes into the reality of monsters, magic, and mayhem. She finally comes to understand how her veil of secrets is unhealthy and dangerous and how reacting without thinking puts her friends and family in grave danger. This story will endear young readers to Zoey as she takes her journey of self-awareness, survival, and redemption. “You are the answer. All you have to do is believe.” I take this quote, my quote by the way, to heart. There’s always a solution. I use it to try harder, longer, better. You make it happen. Make it so. Zoey Le Mar is available in paperback on CreateSpace and on Amazon in both paperback and digital. Mike, thank you so much for spending time with us. All of us with daughters and granddaughters—any little girls—in our lives look for good, strong models for them! Great interview and sounds like a terrific story too. Congratulations, Mike, on your novel. Good questions Linda. Lovely blog.